My first experience of Directed Observation (DO) hours was at John Burroughs High School with Dean Tiffany ATC, Caitlin Gibson (PY2), Danielle Jabczynski (PY1). It was also my first experience to look around a high school in the United States, and actually I am so lucky to have John Burroughs School as my first one. They have clean, orderly AT room and every student athlete respects Dean and also PY students. The most impressed DO experience for me is a Spring Soccer Tournament at Lou Fusz Rams Park and Fenton Soccer Park. That was the largest soccer tournament for young athletes at St. Louis and there were more than 5 soccer fields inside and outside. 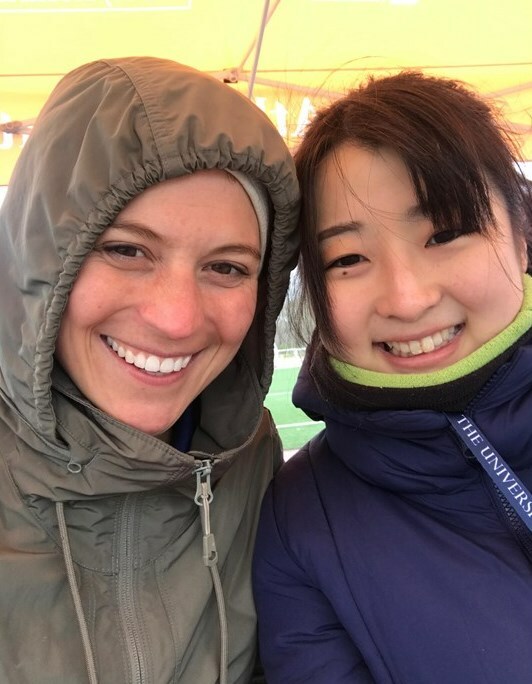 At Fenton Soccer Park, SLU Alum Kelly DeGreeff MAT, ATC was with me telling me the importance to have communication with not just athletes or patients, but also coaches and referee, who relates to a game. Young athletes are more sensitive and emotionally unstable than grown athletes, so that’s why ATs need to be more careful and keep an eye out for them. The communication makes us easier to understand athletes condition or a background that should be considered when ATs treat patients. To be honest, I was quite nervous to do DO hours because of the language barrier, but at the same time I was excited that I got an opportunity to feel the reality of ATs in sports field in my bones. Since I was a student athletic trainer when I was in japan, which was 2 years ago, one of the reasons why I came to the US is to feel the difference between the countries. All of my DO experiences including John Burroughs HS, SEC Gymnastics Championships, Washington University, Track meet at SLU, and the Spring Soccer Tournament were absolutely great opportunities for me to feel and understand the difference. Thank you all the preceptors and older students, and I also want to thank all of my friendly classmates. When I think back to my days as a high school student, I think of all those who made an impact on my experience. Teachers, friends, coaches, anyone who helped to shape the person I became at graduation. Some of my favorite moments came from the sidelines during football games with the Athletic Trainer. Although my high school does not have a full-time Athletic Trainer, we were able to bring an AT in to do game coverage. Even in the short amount of time I was able to spend with him, I learned a lot about the profession and what it entails. I felt this same excitement as I observed in high schools this semester, particularly with Scott Kugler ATC at Chaminade College Preparatory. Having the opportunity to observe Scott was an absolute honor. He has been an Athletic Trainer at Chaminade for over 10 years, which has allowed him to gain the trust of the athletes he treats and the coaches with which he interacts. One of my favorite things about Scott’s relationship with the athletes is when one also happens to be a student in his Anatomy course. He is constantly trying to teach and encourage these athletes. If one of his students comes in with an injury, he quizzes the student on what could possibly be affected, depending on the area that is injured. Pushing these athletes and others to be the best version of themselves, building a relationship with the athletes seems to come naturally. Learning the importance of a developed relationship with those you treat and interact with was definitely one of the most important things I observed. However, it was not the only thing I was able to learn while at Chaminade. Scott made sure to always explain what he was doing and why. He ensured that I knew what was going on, even if I may not understand everything about it. Observing in Athletic Training rooms these past several months brought me great humility, as it reminded me that we, both as individuals and the profession as a whole, are always growing and learning. Our work as Athletic Trainers is exciting and can make a huge difference in the lives of the athletes we treat. 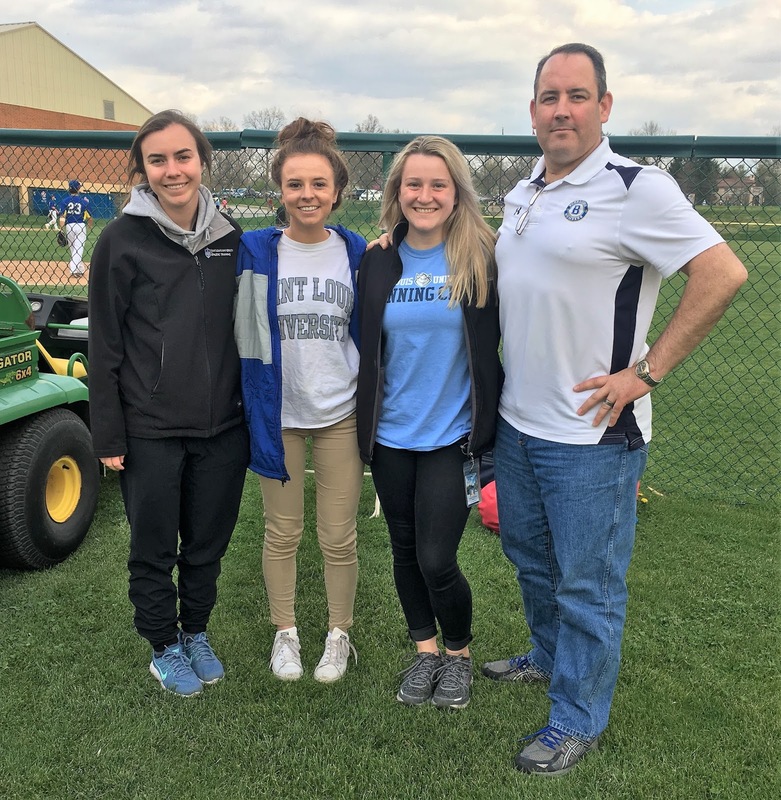 I am a junior in the Saint Louis University Athletic Training Program and I am thankful to say I have had the opportunity to observe at a few different places this semester, as well as watch different sports. 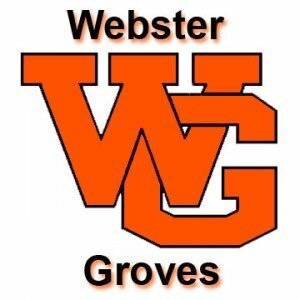 Coming from St. Louis, I was very excited to go back to my high school, Webster Groves, to observe in the AT room just as I did as a senior. It was different being back as just an observer when I was once an athlete and a student. As I watched athletes get helped, I realized that I had much more knowledge than I did. I felt like I learned a lot by listening to how my preceptors asked questions. I have always found it difficult to ask the right background questions and take history. Observing this was a great way for me to practice taking history in my head. In February, I had the opportunity to observe a hockey tournament game between Iowa State and McKendree University. The tournament was held at the Webster Groves rink, which is place I grew up skating at and watching my friends play at in high school. Hockey is a sport that I enjoy watching and would like to work with in the future, so I was very excited for this opportunity. Nothing too crazy happened while I was there, but I did get to see how AT's prepare for the game. I was happy to experience how an athletic trainer's typical day would go at a hockey tournament. Whether that meant standing for hours or being really cold, I was happy nonetheless. As I look ahead at the next two years in the AT program, I am excited and ready to start my journey working at a clinical site instead of observing. I feel as though the places I observed have helped me prepare for what it'll be like when I am at my own site. I am excited to use the knowledge I have gained over the past few years and put my skills to practice. Although I am nervous to start the professional phase of the program, I am excited to be that much closer to my goal of becoming an Athletic Trainer. As a Junior in the SLU AT program, I am getting ready to transition into the professional phase of the program. It is hard to look ahead and know exactly what to expect and what it will be like starting with Gross Anatomy this summer, but throughout MAT 3000 and direct observation hours, I have gotten a much better grasp as to what I will experience these next two years. I got to experience a lot of different settings in my Directed Observation (DO) hours, including the Missouri Valley Conference basketball tournament at the Scottrade Center, SLU Club Hockey at Webster Groves, SLU Track and Field at the Medical Campus track, and both the Southeastern Conference gymnastics championships and NCAA gymnastics championships at Chaifetz Arena. My favorite experiences were at hockey and gymnastics. 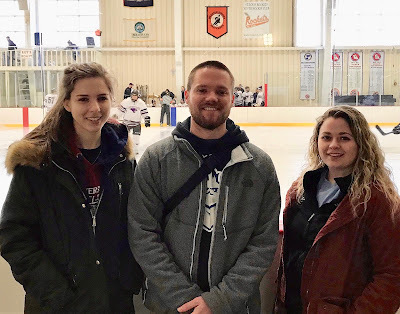 I enjoyed the fast pace of hockey and witnessing PY2 student Pat O’Neill and Dr. Timothy Howell discuss their opinions of a shoulder injury of one of the opposing players, and hearing their thoughts of how that team’s athletic trainer was handling the situation and the injury. At gymnastics, which I had never before seen in person, it was cool to see the amount of team morale and crowd support, and the constant cheering as each event took place simultaneously. 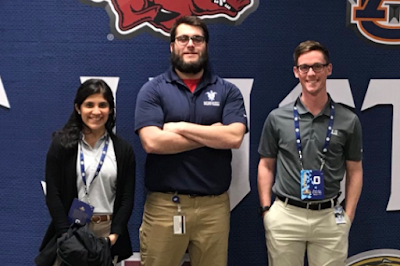 I got a lot of insight from PY1 students Adam Long and Jazmon Carroll at the SEC Championships about their clinical experiences and what to expect as I move on to the professional phase of the program. 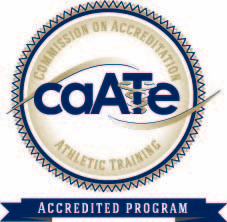 After learning some basic skills in MAT 3000 and doing direct observation hours, I am really excited to begin the next phase of the program and work towards the Master of Athletic Training Degree and AT certification. Hearing from current students above me has given me the confidence to know that no matter how hard anything seems now, that I will be able to excel in the program. I can’t wait to move forward and continue this journey in the SLU AT program. This semester I spent most of my directed observation hours at John Burroughs High School. On my very first day I was a little skeptical because I simply didn’t know what to expect. All of my skepticism melted away by the time I entered the athletic training room. I was welcomed by Danielle Jabczynski and Caitlin Gibson and introduced to preceptor, Dean Tiffany ATC. I automatically felt a positive presence and that it would be a great learning atmosphere. John Burroughs has an awesome Athletic Training room too, so I was able to see new tools and equipment used that I had never seen before. 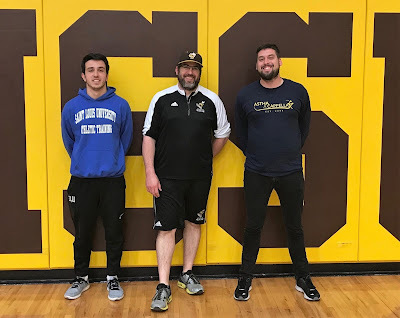 As the weeks went on at John Burroughs, I became more acclimated to the flow of what it means to be an athletic trainer and the many services and skillsets that one acquires. I saw all of the taping demonstrations, learned how an electrical stimulation machine works, and learned certain modalities used to help decrease pain. One of my favorite things to witness was how Dean, Caitlin, and Danielle analyzed injuries, tested range of motion, and created fitness tests. This was a really cool part of athletic training that I am excited to learn more about in the future. 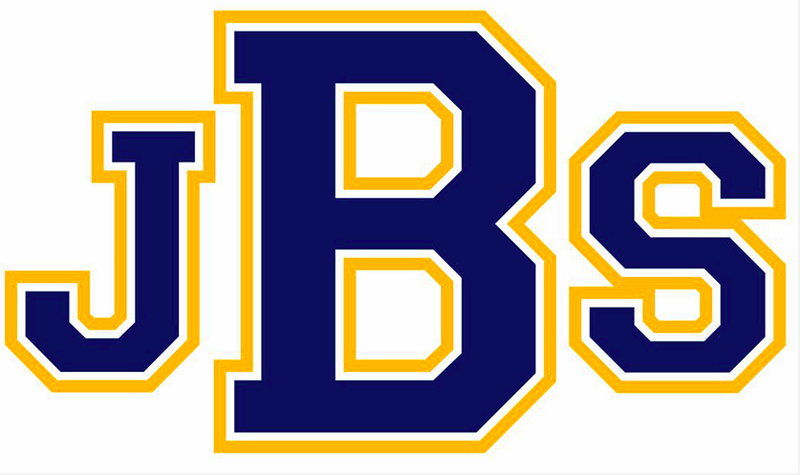 Overall, I am looking forward to becoming more acclimated within my profession, and I am very thankful for the time I was able to spend at John Burroughs. I entered the Athletic Training program in Fall 2016 as a transfer student, and it’s crazy to think I will be a PY1 this upcoming Fall! I did not take the traditional path to college, but that has not stopped me from having amazing opportunities as an AT student at SLU. Some of the highlights of my time in the AT program have been through the directed observation opportunities. I had really great experiences being a DO student, but two of my favorites were observing at Harris Stowe State University and attending the SEC Gymnastics event. Attending the SEC Gymnastics was a fun experience because it was the first time I had ever seen gymnastics in person and I was amazed at the skill and dedication the gymnasts had for the sport. Two PY1 students and I were there, Adam Long and Matt Eifert. They were both really great to work with that day! Despite the busy environment at this event, I paid close attention to how the athletic trainers from the different colleges there that day treated their athletes. Being at the SEC Gymnastics event gave me the opportunity to see how athletic trainers work in a much larger setting, which was a really unique experience that I am really grateful to have had as a pre-professional AT student. It was awesome seeing how close of a relationship the athletic trainers had with their athletes, and it was clear to me that the athletes were very thankful for all that their athletic trainers were doing for them. I am really looking forward to one day having that type of relationship with the athletes I work with as I enter the professional phase of the program. Another great observation opportunity was when I went to Harris Stowe State University. Killian Hollo, who is a PY2 student, and the head Athletic Trainer Tim Herlihy ATC were very welcoming and really made me feel involved in the few hours that I was there observing. I learned a lot that day and I even got to see a chiropractor work with the student athletes! That was a really cool experience and it was great talking to the chiropractors and learn more about their profession. I am so happy and grateful for all the amazing opportunities I have had at SLU. I can’t wait to see the amazing opportunities to come. 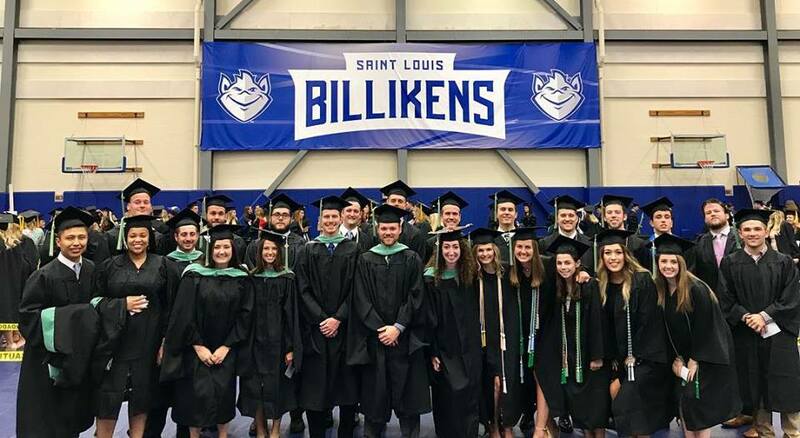 As I am wrapping up my third year in the SLU Athletic Training program and looking ahead to what will come next, I am reflecting on the experiences I have had so far within the program. This year I was able to participate in Directed Observation hours in order to get a better understanding of what my future would look like as an athletic trainer. I also was a great opportunity to get to know older students in the program and get their advice on how to best succeed in the program. While at the sites, I was able to meet many of the preceptors that I could potentially be working under next year. This was awesome to get to know them before hand and get a grasp on what my clinical experiences will be like next year. 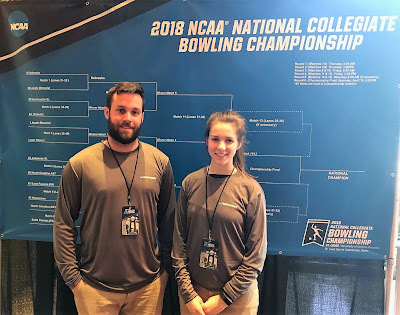 A few of the sites I was able to attend were Fontbonne University with PY1 Chase Long, WashU with PY2 Jenna Ginsberg, the Missouri Valley Conference Men's Basketball Tournament, and SLU Club Hockey games. Fontbonne and WashU were great experiences to see how a college athletic training room functions as at this point in my education, I am interested in college athletic training. They also were great about explain what they were doing and telling me in which class I would get to learn more about it. The MVC tournament was a fun experience in which I got to see how a large-scale event works in terms of taking care of the athletes, as well as, it was cool to be on the sidelines of a Bradley University game as I grew up watching their games. Finally, SLU hockey was an eye open experience to see the difference that occur when treating athletes in a ice rink. This semester has made me excited to enter the professional phase of the program and begin getting hands on experience. It has prepared me a great deal for the fall and I know this summer will prepare me even more. Although I am slightly nervous for Gross Anatomy this summer, I am more excited for the experience and feel it will benefit me greatly. Plus I will get to spend the summer getting to know my classmates that I will be spending a lot of time with the next two years! 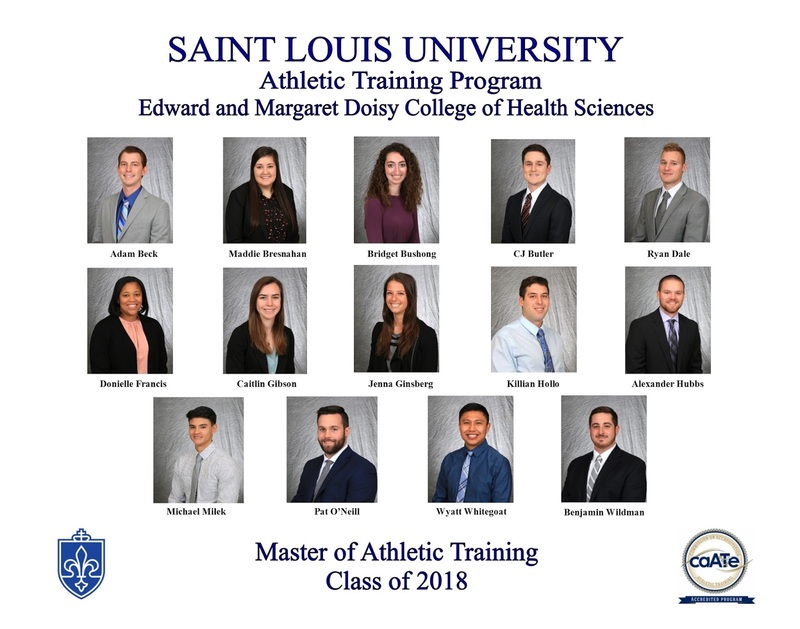 As my third year in the pre-professional phase of SLU’s Athletic Training program comes to an end, I am left with a sense of pride for everything accomplished up until this point, along with feelings of anxiousness for what is to come during the ever-encroaching professional phase starting this summer with Gross Anatomy. During my junior year, I was given the opportunity to attend the MOATA Conference as well as engage in directed observation hours at multiple locations. Both of these opportunities gave me better incite at what I will one day be doing in my future career as an Athletic Training and the various types of settings there are to work in. One of the most unique experiences I participated in this semester was being able to attend the NCAA Women’s Gymnastics Championships. I had the opportunity to observe our program’s PY students and certified Athletic Trainers from across the country. Another location I fortunate to be able to have directed observation hours at was John Burroughs School. While there, I got to experience the high influx of athletes coming and going for rehab, injury evaluations, taping, and precautionary care. The head Athletic Trainer, Dean, was very welcoming and insightful with any questions I had about the profession. The PY students at JBS, Danielle (PY1) and Caitlin (PY2), were also very helpful with any inquiries I had about the program. They both told me about their prior experiences up until this point and what their plans are for the future. With all of the opportunities and experiences I have been granted by being a student in SLU’s Athletic Training program, I feel that I am going into the professional phase well prepared and excited for whatever my future holds. 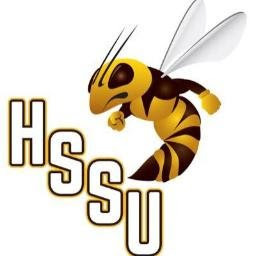 The experience at HSSU this spring of 2018 has been one of great value. Progressing through the semester, Tim, the Athletic Department, and the athletes have trusted us with comprehensive patient care. This care sometimes means managing an immediate situation. This care sometimes involves a more scholarly task like documenting in sportswear for 45 minutes. 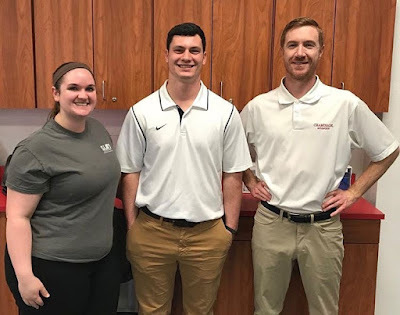 Though not always glamorous, each of these angles of patient management has shown their value to mold Athletic Training master level students into groomed healthcare professionals. Each day builds more trust with the Hornet family. As the relationship builds, we see more about our patients and Athletic Department than just the visible. What was once black and white is replaced by the brown and gold color of unique trends and quirky natures that only Harris Stowe could bring out. And that in essence becomes part of an Athletic Trainer of the university. 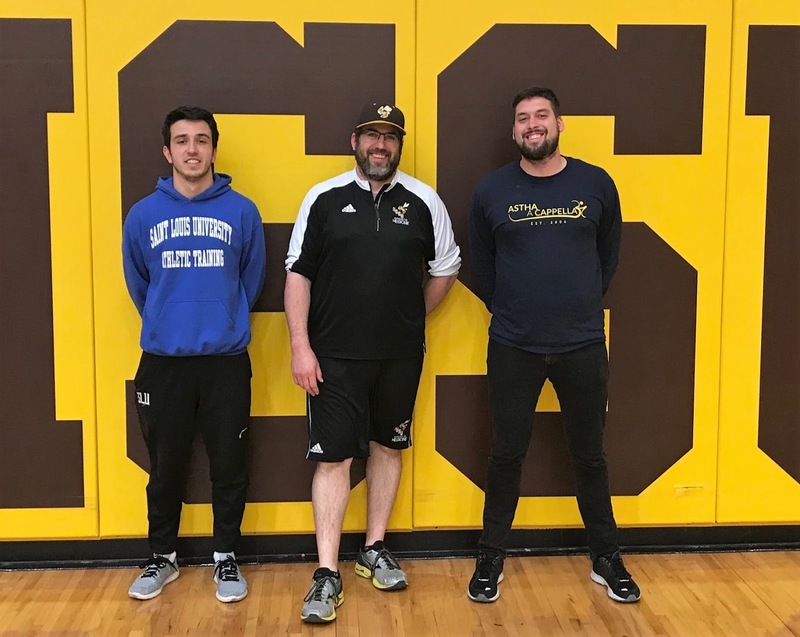 The role not only provides medical care to student athletes, but also yields another outlying personality to keep the hornet family functioning at its interesting self. Graduation from SLU comes soon. We don’t know what it will bring. A job might take us overseas or keep us close to home. What we do know is that the experience at HSSU will travel with us, with the lessons from friends made along the way. Being a 3rd year undergraduate Athletic Training student, I am excited to be finishing up my pre-professional education so I can go on to the professional phase, do clinicals and take classes directly related to the job field. The excitement has been gradually building up over this last semester, due to our requirement of doing Directed Observation (DO) hours. 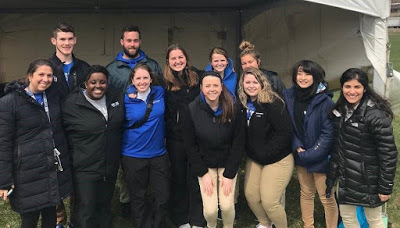 In order to start acclimating into the mindset of being an Athletic Trainer, the 3rd years were all required to put in a certain number of hours joining the PY students at their clinical sites to do observation. 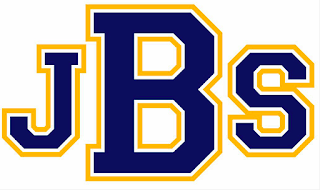 I have completed hours at SLU club hockey, the MVC Basketball tournament, Webster Groves High School, Washington University, NCAA Bowling, NCAA Gymnastics, and John Burroughs School. Two of the sites that I believe I gained a lot from were the NCAA Gymnastics tournament and Washington University. I was able to experience the Gymnastics tournament with other DO students, PY students, and some certified Athletic Trainers. With high school gymnastics season being over and SLU not having a team, there weren’t many opportunities to observe the sport, so I was beyond excited to have this opportunity. Some of the certified ATs and PY students were even gymnasts in the past, so it was amazing to be able to get my questions answered by people who had direct experience with the sport. I was also able to observe the physicians and massage therapists that some teams brought with them. I went to do DO hours at Wash U with Jenna Ginsberg. She went out of her way to show me how everything there worked, from how to set the athletes up for stim to writing the reports for each athlete she interacted with. She also answered many of my questions regarding the curriculum in my upcoming PY years. It was a completely different experience from the NCAA Gymnastics tournament, so it was great to be able to see multiple sides of Athletic Training. I’m excited to see when it takes me in the future. 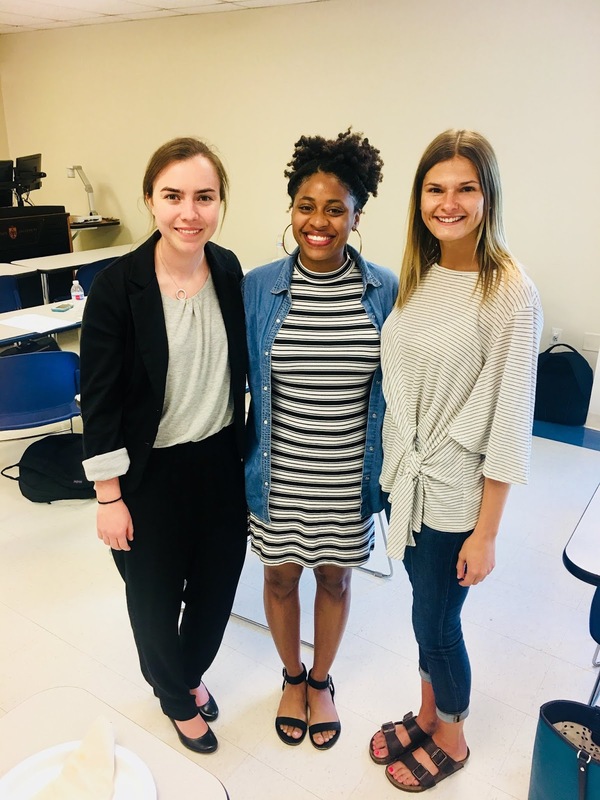 The Saint Louis University Athletic Training Program hosted its Annual Master of Athletic Training Capstone Day on May 4, 2018 in the Allied Health Building. Students in the SLU MAT Class of 2018 publicly presented their Capstone Projects to SLU faculty, students and other stakeholders. 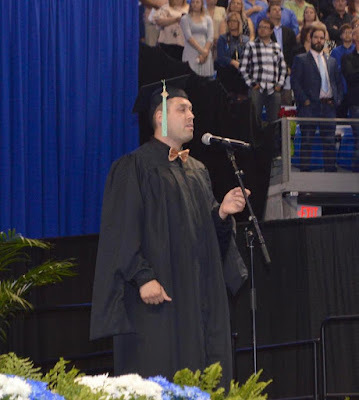 The SLU AT Program also recognized several 2018 MAT graduates with its annual program awards. Caitlin Gibson was also recognized for Excellence in Professional Service. Another award, for Academic Excellence, will be presented once final grades are posted prior to graduation. Going into Junior year, I was a bit nervous with Directed Observation (DO) hours and the last year before becoming a Professional Year (PY) student. It all changed going to my first DO experience with PY2 student Caitlyn Gibson, PY1 student Danielle Jabczynski, and Dean Tiffany ATC, the athletic trainer at John Burroughs. The AT room there was so different than anything I’d ever seen. Going there was definitely an eye opener and I’m very thankful for the experience. What really got me excited for going into professional phase was the NCAA Gymnastics championship. I’ve never had experience with gymnastics before and I didn’t know much about it and thought that I wouldn’t enjoy it all too much, but doing DO hours there really changed my mind. It was very fast paced with everything going on and a different atmosphere that I’d never seen before. It was nice having PY1 student Jazmon Carroll to explain how everything worked and AT faculty member Dr. Timothy Howell make me feel welcomed and talk about the next two years of the program. It was a great experience that I’ll never forget and would love to do more events like that again. I think doing DO hours really helped me with what I will be doing the next two years and what I need to learn to become the AT I want to be. Talking with the older students about gross anatomy really made me feel better knowing that if they can do it, so can I. The DO hours gave me a head start for my PY years and I can’t wait to see what the future has in store. 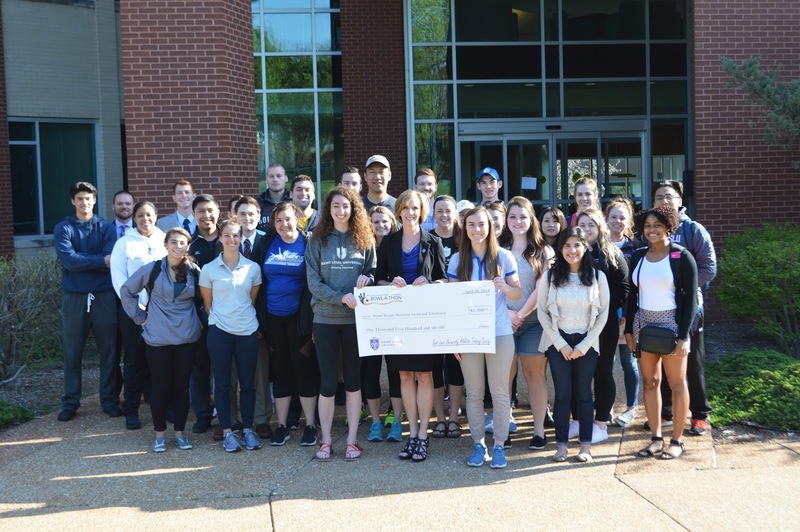 The Saint Louis University Athletic Training program recently announced the creation of the Brandi Burgett Memorial Award and Scholarship. The scholarship, for which any student entering their second professional year in the Athletic Training program is eligible to apply, will be awarded for the first time for the upcoming 2018-2019 school year. 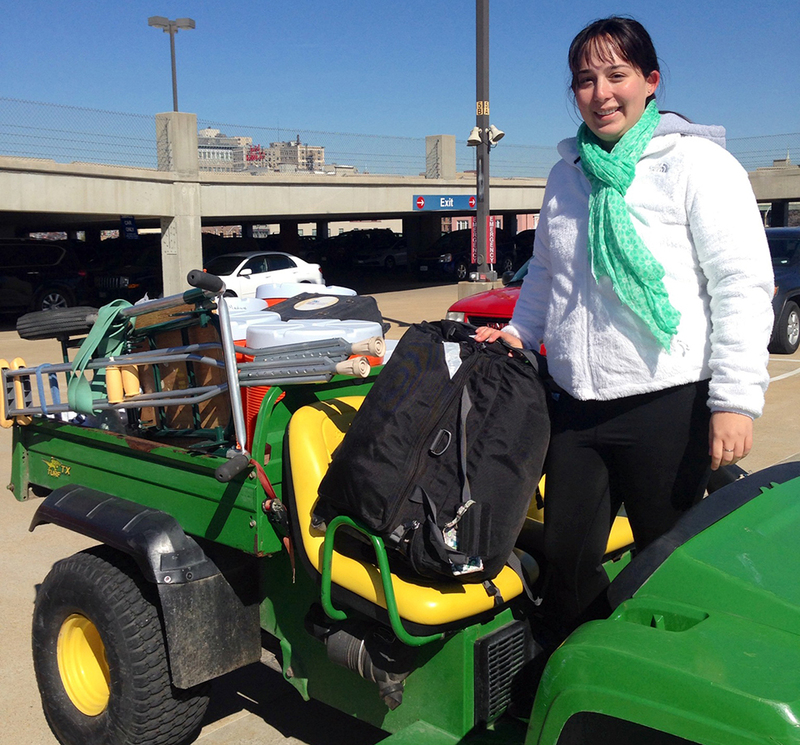 Brandi Burgett, MAT, preparing for her day when she was an Athletic Training student at SLU. 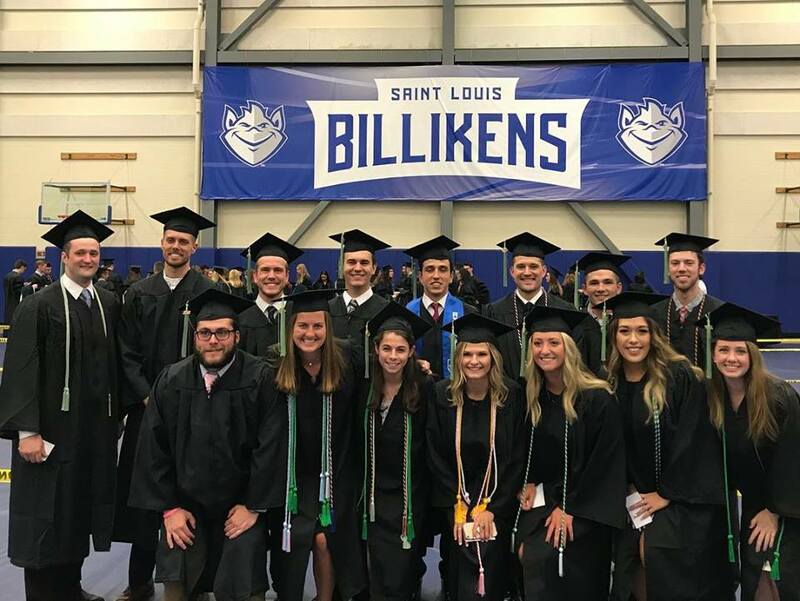 The scholarship was created in memory of Brandi Burgett, MAT – a 2017 graduate of the SLU Athletic Training program. A native of Temecula, CA, Brandi came to SLU to study Athletic Training despite living with the pain and other symptoms of Crohn’s Disease. While living with Crohn’s disease, Burgett still brought a passion for her studies and for life that was inspiring among her peers as she was involved in a variety of activities across campus. The scholarship was created, in large part, by generous gifts made by Brandi’s parents - Bob and Marnie Burgett – family and friends. 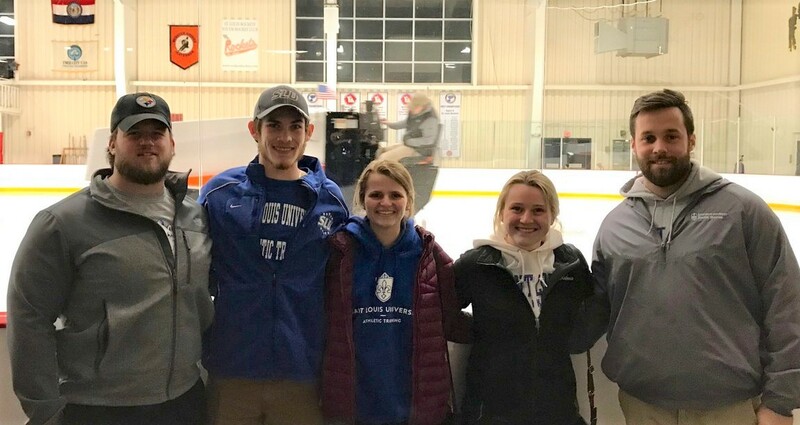 In addition, the Saint Louis University Athletic Training Society (SLATS) dedicated all of the proceeds from its annual Bowl-A-Thon fundraiser to the scholarship fund. Bob and Marnie Burgett saw creating the scholarship as a fitting way to honor their daughter’s legacy, preserve her story and help students that have the same passion for helping others that Brandi possessed. Any Athletic Training student entering their second professional year can apply for the scholarship. The recipient will be a student that has demonstrated the ability to approach Athletic Training with the same passion shown by Brandi and is involved in activities within the program. Also, preference will be give to applicants who have had to overcome adversity in their pursuit of graduating. 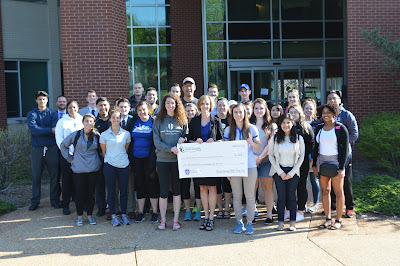 The Saint Louis University Athletic Training Society (SLATS) presenting a check from the group's annual Bowl-A-Thon fundraiser to DCHS Dean Mardell Wilson, EdD, RD, LDN. SLATS dedicated all of the proceeds from this year's fundraiser to the Brandi Burgett Memorial Award and Scholarship fund. Bob and Marnie knew that this scholarship would be a great way to complement the passion that Brandi had for helping others. “Our hope is that we can make a difference in a young person’s life. Brandi was challenged her entire life with a debilitating disease. We want to help make a difference and help another student with some funds that will get them through a rough time. 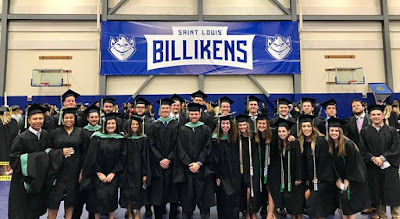 The student can look to [SLU Athletic Training Program Director] Dr. Anthony Breitbach and learn about how Brandi overcame her challenges to get her Master of Athletic Training degree,” Bob and Marnie said. DCHS Dean Mardell Wilson, Ed.D, RD, LDN, was hopeful that future students could be inspired by Brandi’s story. "In the Doisy College of Health Sciences, we are a family. Whenever we lose someone from our family, it is heartbreaking,” Dr. Wilson said. “However, the creation of this scholarship allows us to focus on Brandi's inspirational journey through life. In the face of true adversity, Brandi excelled. Now, her mission to help others will live on through her legacy as this scholarship will support students in realizing their dreams and carry on Brandi’s passion for the profession of Athletic Training." Each spring at Commencement, graduates hear the president say that, though their time on this campus may be over, the individuals that have walked these halls remain sons and daughters of SLU forever. The passion for this university and the sense of home that so many of the students here feel was as strong with Brandi as it was with anyone. To learn how to contribute to the Brandi Burgett Memorial Award and Scholarship, contact DCHS Development Director Michelle Cohen at michelle.cohen@slu.edu. 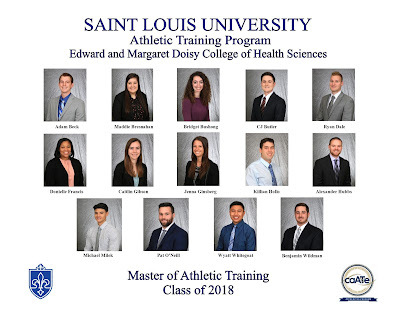 The Athletic Training Program in Saint Louis University's Doisy College of Health Sciences is hosting its Annual Master of Athletic Training (MAT) Capstone Day on Friday, May 4, 2018. 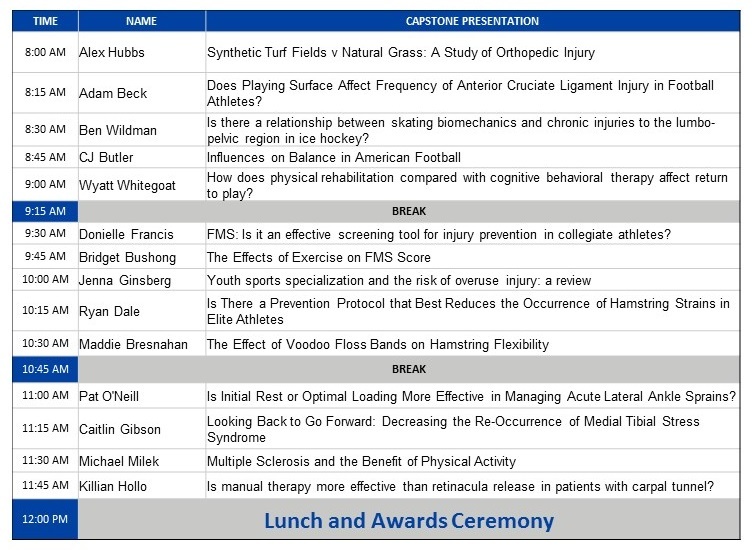 The MAT Capstone Day will take place in room 2030 of the Allied Health Professions Building on SLU's South Campus. Students in the SLU MAT Class of 2018 will present their Capstone projects. These projects represent a culminating scholarly work from these students' experience in the SLU AT Program. 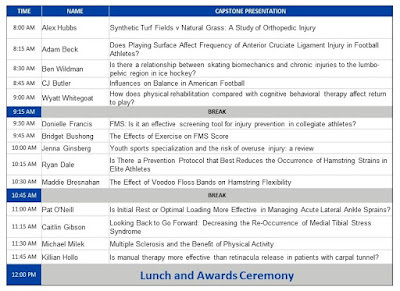 The presentations will be followed by a Program Awards and Recognition Ceremony. The event is open to any members of the greater Saint Louis University community, including friends and families of the SLU AT Program. For more information about the SLU MAT Capstone Day, call 314-977-8561 or email atep@health.slu.edu.